All Aboard the 1.25 to Shrewsbury! Click on image for enlarged view! Well over a hundred prospective passengers gathered at Carno station last Sunday morning to demonstrate the growing support for the station re-opening campaign. 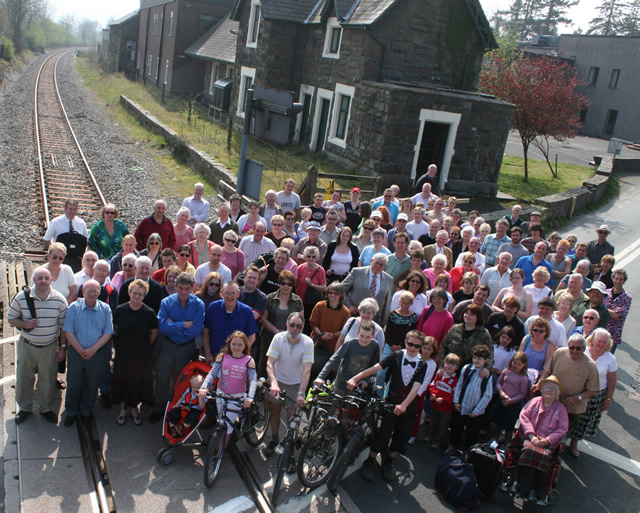 Nearly all trains currently stop at Talerddig to pass each other, but the Carno Station Action Group wants to see the passing place moved from Talerddig to Carno as part of the infrastructure changes for the new hourly service. This would enable the trains to serve the needs of the expanding local community when they stop to pass.